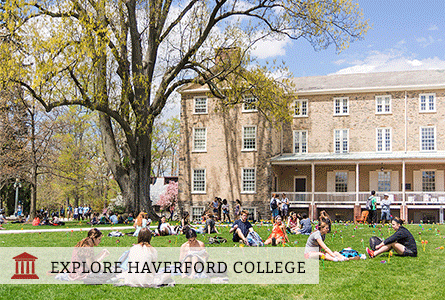 Greetings from the Haverford College QuestBridge Scholars Network! We are writing to welcome you into our lovely home here in Haverford, PA about a 10 minute drive outside of Philadelphia. On campus we work to foster a positive and safe setting for students, especially those who hail from low-income, first-generation, and minority backgrounds while also encouraging a culture of giving back to the community through service. We have different groups within the QSN here at Haverford that target various goals: presenting about QuestBridge to high schools in Philadelphia, doing service both on and off campus, and maintaining the Quest Mentoring Program to help students transition during their first year on campus. Our QSN is continually growing our ties on campus. Currently, we actively participate in a collaborative known as Flourish, where we co-host monthly workshops on the ins and outs of navigating college. Our work with organizations on campus (such as the Tri-College Institute for Social Justice, Horizons, and Multicultural Scholars Program) help to provide all the necessary information to get through these challenging (and exciting!) four years known as our undergraduate college experience. The QSN here at Haverford knows how to have fun too! Every year we host a fall break "extravaganza" where we gather to eat a home cooked meal at least once during the break in our Multicultural Center. We also come together to make a Thanksgiving dinner and enjoy everyone's company. And everyone gets excited for our year-end event commemorating our seniors while also toasting to a year well spent. We wish to welcome you among us in the coming years!